Importance: Differences in technique and outcome between fat transposed to the subperiosteal and supraperiosteal planes during transconjunctival lower blepharoplasty remain to be elucidated. Objective: To provide a single-surgeon comparison of transconjunctival lower blepharoplasty with fat repositioning (TCBFR) to the subperiosteal vs the supraperiosteal plane. Design: A retrospective medical record review of patients who underwent TCBFR to the subperiosteal or the supraperiosteal plane by a single surgeon from January 1, 2009, through December 31, 2011. Differences in surgical technique, postoperative course, complications, patient satisfaction, and aesthetic results (by blinded assessment of preoperative and postoperative photographs) are reviewed using a 4-point scale. Setting: An ophthalmic plastic surgical practice. Participants: The first 20 consecutive patients who underwent TCBFR to the supraperiosteal plane and the previous 20 who underwent TCBFR to the subperiosteal plane. Intervention: Transconjunctival lower blepharoplasty with fat repositioning. Main Outcome Measures: Intraoperative findings, postoperative course, complications, and aesthetic results. Results: We included 40 patients (27 women and 13 men) with a mean age of 57 years and mean follow-up of 10 months. Subperiosteal TCBFR was more meticulous and less disruptive of normal anatomy and resulted in less bleeding. Supraperiosteal surgery was faster yet more traumatic, leading to more bruising, swelling, and with more clinically evident temporary postoperative contour irregularities. All patients expressed a high level of satisfaction (100%). Blinded assessment of results demonstrated no statistically significant difference (P=.45) between the 2 surgical approaches with regard to the final aesthetic result. Conclusions and Relevance: Transconjunctival lower blepharoplasty with fat repositioning can be performed safely and effectively, whether fat is translocated to the subperiosteal or the supraperiosteal plane. Aesthetic results are comparable between the 2 approaches. JAMA Facial Plast Surg. 2013;15(3):176-181. Published online March 7, 2013.
via a transconjunctival entry and historically only in the subperiosteal plane.1,6,9 Debate remains whether the subperiosteal or supraperiosteal plane is superior for fat transposition. Discussion has focused primarily on individual surgeon experience with a particular approach, but a single-surgeon comparison of the 2 publications is lacking. 20 who underwent TCBFR to the subperiosteal plane. This comparison allows for an analysis of differences in surgical technique, recovery, and outcome by a single surgeon. We retrospectively reviewed the medical records of an equal number of patients who underwent TCBFR to the subperiosteal or the supraperiosteal plane from January 1, 2009, through December 31, 2011, performed by a single surgeon (G.G.M.). Informed consent was obtained before each procedure. The review adhered to the standards of the Declaration of Helsinki and was compliant with the Health Insurance Portability and Accountability Act. Patients were subdivided into 2 groups. One group included those who underwent subperiosteal fat transposition; the other, those who underwent supraperiosteal fat transposition. Patients with a history of eyelid surgery, trauma, or inflammatory disease were excluded from the study. Additional interventions, such as skin excision, canthoplasty, fat grafting, or postoperative fluorouracil injections, were noted. Patients were examined at regular-interval follow-up appointments, and digital photographs were recorded. The surgical technique, intraoperative findings, postoperative course, aesthetic results (based on blinded comparison of preoperative and postoperative digital photographs), complications, and patient and physician assessment of surgical outcomes were analyzed for both groups. Two cosmetic surgeons and 2 nonmedical personnel individually assessed the preoperative and postoperative photographs using a 4-point scale (0 indicates no change; 1, mild improvement; 2, moderate improvement; and 3, complete improvement). Statistical analysis was performed using the paired t test, with significance set at P≤.05. The TCBFR procedures were performed under conscious sedation or general anesthesia, depending on concomitant procedures and patient preference. The nasojugal groove was demarcated with amarking pen in the preoperative area with the patient in an upright, sitting position. Once anesthesia was induced, the patient was prepped and draped, and the nasojugal groove was infiltrated to the periosteum with a combination of 2 mL of lidocaine hydrochloride (Xylocaine), 1%, with 1:100 000 epinephrine. Two milliliters of the same anesthetic mixture was then infiltrated transconjunctivally. An incision was made 5 mm below the inferior tarsus the full width of the eyelid through the conjunctiva and lower eyelid retractors. The conjunctiva and retractors were engaged with a 4-0 silk traction suture that was secured to the head drape. Dissection proceeded to identify the nasal and central fat pads and the inferior oblique muscle between them. Freely mobile nasal and central fat pedicles were fashioned as previously described. 1,6,9,10 The temporal fat pad was excised conservatively. In subperiosteal surgery, an incision was made through the arcus marginalis just below the inferior orbital rim. A Freer elevator was used to raise the periosteum over the upper face of the maxilla and around the directly visualized infraorbital neurovascular bundle (Figure 1A). Meticulous dissection ensued around the nerve to avoid inadvertent traumatization. Dissection proceeded approximately 15 mm below the orbital rim, creating a continuous pocket for fat transposition. In supraperiosteal surgery, the suborbicularis oculi fat (SOOF) is identified centrally over and below the infraorbital rim. Blunt dissection with Stevens tenotomy scissors was performed in a spreading fashion to create a dissection pocket. Nasally, the SOOF was attenuated and difficult to identify. The cutting mode of the electrocautery unit was used to incise the origin of the lip elevator muscles (levator labii superioris alaeque nasi [LLSAN] and levator labii superioris [LLS]) just below the orbital rim. Blunt, spreading scissor dissection was again used to create a pocket nasal to the infraorbital neurovascular bundle in this plane (Figure 1B-E). 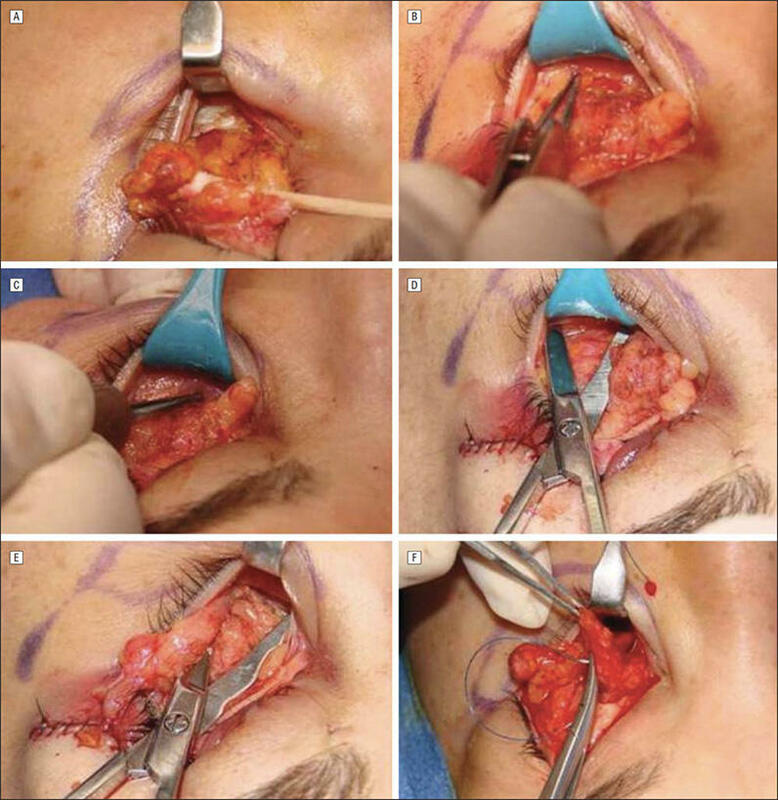 In supraperiosteal surgery, dissection was limited to 10 mm below the infraorbital rim to avoid potential injury to the motor branches of the relevant muscles of facial expression in the surgical field (LLSAN, LLS, and orbicularis oculi). With both publications, the 2 fat pedicles were engaged with a 4-0 polypropylene suture (Prolene; Ethicon) on a long needle (PS-2; Ethicon) brought transcutaneously into the wound (securing fat in a horizontal mattress fashion) and then exiting the skin again (Figure 1F). The suture was secured over a bolster, and the wound was allowed to heal by secondary intent. Alternatively, the fat pedicles can be secured with absorbable suture within the wound; however, this procedure has not been our preference. We included 40 patients in this report, 20 each (50%) in the subperiosteal and supraperiosteal patient groups. Twenty-seven patients (68%) were women and 13 (33%) were men. The mean patient age was 57 (range, 31-72) years; mean follow-up, 10 (range, 4-32) months. These numbers were roughly equal for each subgroup (subperiosteal and supraperiosteal). Eleven patients (28%) had a skin excision; 9 (23%), canthoplasty; and 5 (13%), fat grafting (lateral eyelid-cheek interface or midface) included with TCBFR. These procedures were also almost equally distributed between the 2 groups. All patients (100%) noted some degree of transient induration over the repositioned fat pedicles in the immediate postoperative period (4-6 weeks). Three patients (15%) from the supraperiosteal group experienced obvious and prolonged postoperative contour irregularities over the transposed fat pedicles in the form of ”bulges,” presumed to represent fat granulomas. In each case, the bulges eventually resolved with 2 serial injections of fluorouracil (0.2 mLof fluorouracil at a concentration of 50 mg/mL, spaced 2 weeks apart). No patients from the subperiosteal group demonstrated this finding. In general, the surgical procedure was faster, yet bloodier, and postoperative bruising and swelling were more significant in the supraperiosteal group. We noted no differences in postoperative sensory disturbances in the distribution of the infraorbital nerve (ION) or in the function of the lower eyelid orbicularis muscle or lip elevator muscles between the 2 groups. No cases of postoperative lower eyelid malposition occurred. Patient and physician assessments of surgical outcome were equally good. On critical evaluation of preoperative and postoperative digital photographs, we noted a slightly improved transition in the lower eyelid-cheek junction in the supraperiosteal group. However, we did not find this to be clinically relevant. On blinded rating by the cosmetic surgeons and nonmedical personnel, a statistically significant difference in aesthetic outcome between the 2 groups of patients (P=.45) could not be identified. Figure 1. The technique of transconjunctival lower blepharoplasty with fat repositioning. A, Surgical rake retracting the lower eyelid demonstrates subperiosteal dissection. B, Forceps point to the suborbicularis oculi fat (SOOF) below the orbicularis muscle. C, Origin of the levator labii superioris muscle (tip of forceps). D, Creation of the intra-SOOF pocket. E, Creation of the submuscular pocket. F, Translocation of the fat pedicle. Parts A and F are reprinted from Massry and Nassif1 with kind permission from Springer Science + Business Media B.V.
to distinct planes (subperiosteal and supraperiosteal) by different surgeons, which somewhat clouded the conclusion. Because our report is a singlesurgeon study, this important variable is eliminated. Although a randomized distribution of patients to one or the other routes of surgery in a prospective fashion is ideal, our initial purpose was to attempt to perform TCBFR supraperiosteally. Only after 20 procedures were performed with adequate follow-up did a confidence in making intelligent statements differentiating the 2 procedures develop. For this reason, our study is retrospective. In general, TCBFR was faster when performed to the supraperiosteal plane because the pocket created for fat translocation in this plane is made with a simple scissorspreading maneuver rather than a more meticulous subperiosteal dissection around the isolated infraorbital neurovascular bundle. Although the scissor-spreading technique is quick, it leads to more bleeding than does dissection below the periosteum. This observation is especially true nasally. A robust SOOF pocket is found in the central supraperiosteal space. This pocket tends not to bleed (if preinjected with epinephrine-mixed local anesthetic) when a space is created with blunt dissection. However, nasally, where the SOOF is attenuated or absent, dissection occurs below a muscle plane (orbicularis oculi or lip elevators [LLSAN/LLS]). This dissection invariably leads to varied degrees of surgical trauma and bleeding, which are typically not an issue with the avascular subperiosteal plane. When bleeding is encountered in the subperiosteal plane, it occurs most commonly at the nasal aspect, where injury to a perforating vessel can result in brisk bleeding, or centrally, where the periosteum is less defined and diffuse bleeding may be encountered. In either approach, hemostasis is achieved with fine-tip cautery or with direct pressure when the fat is secured with a bolster suture. We find subperiosteal procedures to be a more anatomic approach. The procedure occurs in a natural potential space, the ION is clearly visualized and avoided, and surgery is not traumatic to normal tissue (muscle and SOOF). This approach is very different from the supraperiosteal approach. In the latter setting, the dissection centrally is within theSOOF,which is straightforward and poses little risk of injury to important structures but disrupts normal tissue. However, as stated, the nasal dissection is less defined. Because the SOOF is indistinct in this location, is the suborbicularis oculi muscle or the sublip elevator muscles the appropriate entry point and plane for creation of the dissection pocket? Irrespective of the plane of dissection, these muscles are violated to a certain extent. In addition, in the supraperiosteal plane, the ION cannot be visualized directly, and it or its branches are mechanically and bluntly displaced, as we will discuss. As such, one would assume that the incidence of traction injury may be higher with this technique. Our preference for nasal dissection is below the lip elevator muscles. With this deeper dissection, the chance of developing contour irregularities to the eyelid-cheek interface from transposed fat may be lessened postoperatively. Couch et al8 recently reported on a potentially improved effacement of the nasojugal groove with the supraperiosteal approach related to release of the orbicularis muscle attachments to the periosteum below the arcus marginalis, the orbitomalar ligament (OML). The OML is the fibrous band and connection of the skin and orbital orbicularis oculi muscle to the suborbital rim periosteum. 11 In their study, Couch and colleagues demonstrated that, when the OML is severed (muscle from underlying tissue), the orbicularis muscle edge is elevated and aids in reducing the eyelid-cheek interface depression and improving cosmesis. In subperiosteal surgery, the OML is left intact, negating this potential effect. We did not assess these changes (orbicularis elevation); however, this process makes conceptual sense and must be considered by the individual surgeon when selecting the route by which to reposition fat. Figure 2. 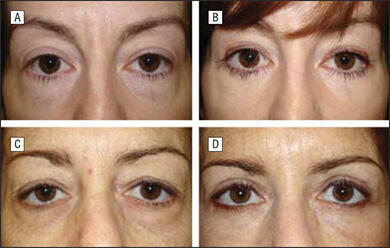 Preoperative and postoperative photographs of patients undergoing transconjunctival lower blepharoplasty with fat repositioning (TCBFR) to the supraperiosteal plane. A and C, Preoperative photographs. B and D, Postoperative photographs of the same patients. E, Preoperative photograph. F and G, Postoperative photographs of the same patient 10 days and 3 months after TCBFR. F, A bulge (granuloma) is seen over the nasojugal groove at 10 days. G, This had resolved at 3 months after fluorouracil injection. As stated in the “Results” section, this study could not quantify a difference in aesthetic outcomes between patient groups studied (by blinded independent review). On close examination of digital photographs, however, we believe that a subtle improvement of the transition and contour of the eyelid to the cheek may be evident in the supraperiosteal group. The 4-point scale used to rate the photographs blindly may not reflect this subtle subjective difference we noted. This difference may be related to the aforementioned orbicularis mobilization with release of the OML. We noted some differences in the postoperative course for the 2 publications. Bruising and swelling are more pronounced and of longer duration in the supraperiosteal group. In both groups, all patients demonstrate a degree of induration (thought to be a granulomatous response) over the transposed fat pedicles in the early postoperative course (first 4-6 weeks); however, in the supraperiosteal group, 3 patients (15%) developed an obvious larger and prolonged bulge after surgery (Figure2E-G). In each case, this development resolved with serial injections of fluorouracil. Fluorouracil is an antimetabolite that has been used in glaucoma surgery,12 dermatologic procedures, 13,14 and eyelid/periorbital surgery15-17 to modulate inflammation and the wound-healing response. These granulomas probably would have resolved over timewithout the fluorouracil injections, but we have found fluorouracil injections to be effective in accelerating this process and free of complications. Although no prolonged bulges were noted in the subperiosteal group, these data can be confounded by the fact that the subperiosteal group underwent surgery performed after hundreds of such procedures by the surgeon in this plane (the surgeon’s historical preference). Figure 3. 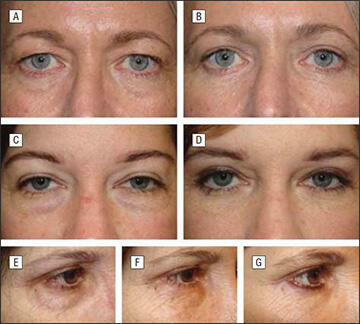 Preoperative and postoperative photographs of patients undergoing transconjunctival lower blepharoplasty with fat repositioning in the subperiosteal plane. A and C, Preoperative photographs. B and D, Postoperative photographs of the same patients. Reprinted from Massry and Nassif1 with kind permission from Springer Science + Business Media B.V. In the supraperiosteal group, the patients included were the first for whom the surgeon performed the procedure by this route. With additional experience, the incidence of postoperative granuloma formation in this group might be reduced. Both routes of TCBFR yielded transient sensory deficits in the distribution of the ION postoperatively. Complete resolution was noted in every case within 4 weeks after surgery, and no overt difference was noted between the 2 groups with respect to the course and duration of this common postoperative finding. The finding is somewhat surprising; the supraperiosteal dissection was expected to result in greater sensory deficit because the ION was not visualized directly and was more susceptible to mechanical trauma. Stretching of the ION at its egress from its foramen with subperiosteal manipulationmight be as traumatic as the blunt spreading of the nerve’s more distal branches with supraperiosteal procedures. In addition, we noted no clinical motor deficit to the lip elevator or orbicularis muscles after TCBFR in either group. As with the sensory issue, this finding was unexpected because nasal dissection in the supraperiosteal plane can traumatize these muscles (or their innervation). We believe that this trauma may have been avoided by limiting dissection to 10 mm below the orbital rim (possibly above the course of the muscles’ motor nerve), or that the preoperative presumed risk is, in reality, minimal. All patients in both groups were pleased with their postoperative results in terms of function and appearance. This result was substantiated by physician and blinded assessment (Figure 2 and Figure 3). Our prestudy belief was that because subperiosteal surgery conforms to normal anatomy and is less traumatic, less inflammation would ensue with better fat survival and filling effect. These suppositions may be true, but they were not evident clinically. This conclusion may relate to fat being placed in a more anterior and vascularized tissue bed when translocated supraperiosteally, compensating for any reduction in fatfilling effect related to increased inflammation. Abbreviations: ION, infraorbital nerve; OML, orbitomalar ligament. aThe X delineates the route of fat transposition by which each factor predominated. Fat repositioning is now a common adjunct of lower blepharoplasty surgery. For this reason, improving surgical technique and outcomes is important. Evaluating the 2 planes of fat transposition is a step in this direction. Subperiosteal surgery is more time consuming and meticulous but clearly the approach that most conforms to normal anatomy. Supraperiosteal surgery is more traumatic, leads to more (although clinically insignificant) bleeding, and can involve a longer recovery (bruising and swelling), but the procedure is also faster and requires less detailed dissection. In addition, transient contour irregularities (presumed granulomas) of transposed fat pedicles may be more common in the supraperiosteal group, and no differences are noted in regard to motor or sensory neurodeficit after surgery (Table). Finally, and most important, surgical outcomes are very similar, and the data from this report do not support superiority of one plane of fat transposition over the other. In summary, transconjunctival blepharoplasty with fat repositioning can be performed safely, effectively, and with excellent results, whether fat is translocated into the subperiosteal or supraperiosteal plane. Differences exist in surgical technique and the immediate postoperative course, but long-term results are comparable and excellent with both approaches. Identifying patient subgroups that may benefit from one approach over the other warrants further investigation. Massry GG, Nassif PS. Transconjunctival lower blepharoplasty: fat excision or repositioning. In: Massry GG, Murphy M, Azizzadeh B, eds. Master publications in Blepharoplasty and Periorbital Rejuvenation. New York, NY: Springer; 2011: 173-184. Loeb R. Fat pad sliding and fat grafting for leveling lid depressions. Clin Plast Surg. 1981;8(4):757-776. Hamra ST. Arcus marginalis release and orbital fat preservation in midface rejuvenation. Plast Reconstr Surg. 1995;96(2):354-362. Perkins SW, Holden PK. Transcutaneous lower eyelid blepharoplasty. In: Massry GG,Murphy M, Azizzadeh B, eds. Master publications in Blepharoplasty and Periorbital Rejuvenation. New York, NY: Springer; 2011:159-172. Goldberg RA. Transconjunctival orbital fat repositioning: transposition of orbital fat pedicles into a subperiosteal pocket. Plast Reconstr Surg. 2000;105(2): 743-751. Massry GG, Hartstein ME. The lift and fill lower blepharoplasty. Ophthal Plast Reconstr Surg. 2012;28(3):213-218. Mohadjer Y, Holds JB. Cosmetic lower eyelid blepharoplasty with fat repositioning via intra-SOOF dissection: surgical technique and initial outcomes. Ophthal Plast Reconstr Surg. 2006;22(6):409-413. Couch SM, Buchanan AG, Holds JB. Orbicularis muscle position during lower blepharoplasty with fat repositioning. Arch Facial Plast Surg. 2011;13(6):387-391. Massry GG. Comprehensive lower eyelid rejuvenation. Facial Plast Surg. 2010;26 (3):209-221. Massry GG. “The Inverse Shoe Shine Sign” in transconjunctival lower blepharoplasty with fat repositioning. Ophthal Plast Reconstr Surg. 2012;28(3):234-235. Kikkawa DO, Lemke BN, Dortzbach RK. Relations of the superficial musculoaponeurotic system to the orbit and characterization of the orbitomalar ligament. Ophthal Plast Reconstr Surg. 1996;12(2):77-88. Fluorouracil Filtering Surgery Study Group. Five-year follow-up of the Fluorouracil Filtering Surgery Study. Am J Ophthalmol. 1996;121(4):349-366. Taban M, Lee S, Hoenig JA, et al. Postoperative wound modulation in aesthetic and eyelid periorbital surgery. In: Massry GG, Murphy M, Azizzadeh B, eds. Master publications in Blepharoplasty and Periorbital Rejuvenation. New York, NY: Springer; 2011:307-312. Massry GG. Cicatricial canthal webs. Ophthal Plast Reconstr Surg. 2011;27(6): 426-430. Massry GG. The external browpexy. Ophthal Plast Reconstr Surg. 2012;28(2):90-95.